Taj Boston has an almost unfair advantage . . . the perfect Back Bay location at the intersection of fashionable Newbury Street and Arlington Street, overlooking the gorgeous Boston Public Garden. With a reputation for impeccable service, Taj Hotel Boston is one of the top luxury hotels in Boston - but it sometimes offers surprisingly affordable rates. Located in the elegant 1927 Regency-Art Deco building formerly occupied by Boston's famed Ritz-Carlton Hotel (now relocated on the other side of Boston Common), the Taj Hotel features rooms with views that can't be beat - the Public Garden with its famed Swan Boats, Commonwealth Avenue's flowering trees and statues, and Newbury Street's très chic boutiques. 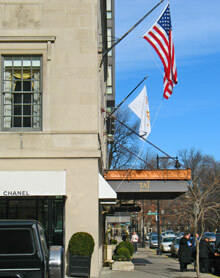 Considered one of Boston's best hotels, Taj Boston belongs to India's luxury Taj Hotel group. You'll enjoy their dedication to providing the best possible experience for their guests, including complimentary car service to the Financial District. The hotel's 273 rooms, including 45 suites, were completely redone in 2002. You'll be pampered with luxurious furnishings and linens, gorgeous marble bathrooms, and plush robes. Like other older Boston hotels, room sizes vary and some rooms may seem small - but this is true in most large cities. If you want a view of the beautiful Public Garden, be sure to make sure your room rate includes this. You can sometimes find deals with free room upgrades. Some suites boast the rarest luxury of all, even among other Boston five star hotels: wood-burning fireplaces. You can also work out in the exercise room, or even better, opt for an in-room massage. Taj Boston features two restaurants, plus its famed hotel bar. A long-time favorite spot for romantic proposals, trysts, and even intellectual discussions, you'll feel like a character in a Henry James novel as you sip your drink in the elegant bar overlooking the Public Garden. A pianist plays from 6pm until midnight on several evenings, and a jazz trio performs on Friday nights. You may feel tempted to spend your entire Boston visit in the bar. But you shouldn't miss afternoon tea in the lounge. Another long-time Boston tradition, the afternoon tea service epitomizes elegance. You can select from a variety of excellent teas as well as wonderful things to nibble. You can explore high fashion and art galleries along Newbury Street . . . Back Bay's splendid churches and Victorian architecture . . . antique shops in Beacon Hill. 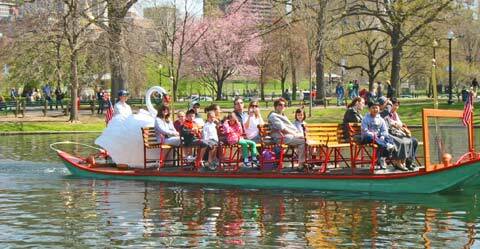 When the weather is nice, walk across the street to the Public Garden and take a ride in the Swan Boats. In the evening, walk to the nearby Boston Theatre District. On the Fourth of July, watch the fireworks on the Charles River from your room (be sure to request a river-view room). In the winter, stroll over to Boston Common and go ice skating on Frog Pond. Hungry? The top Back Bay restaurants and South End restaurants are within easy reach. Here's a prediction: you'll fall in love with Taj Boston and the city . . . and return again and again. 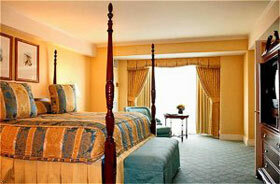 Taj Boston offers some of the most affordable rates of any Boston luxury hotel. Rates vary by season as well as what's going on in the city, so this is a place where it pays to check multiple booking agencies and look hard to find the best deal.